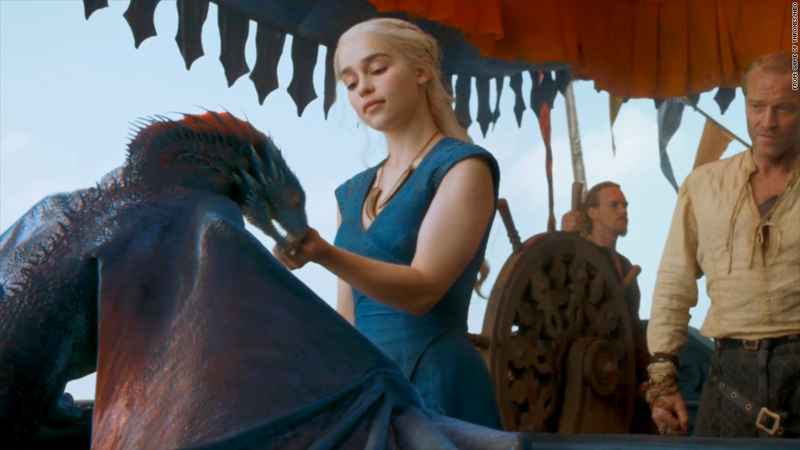 If those who download "Game of Thrones" illegally were paying, the show might be able to afford a few more dragon scenes, co-creator David Benioff told CNN. HBO's mythical drama "Game of Thrones" set a record for modern-day piracy after its Sunday night premiere, as viewers around the globe scrambled to watch the season 3 debut episode that aired on the premium cable network. Piracy tracker TorrentFreak says that more than 1 million viewers downloaded the episode in the first day after it aired. At one point, more than 163,000 people were simultaneously sharing a single torrent -- a new record. The previous record, of just under 145,000 simultaneous file-swappers, was set by the "Heroes" season 3 debut in 2008, according to TorrentFreak's data. The heavy demand for the premiere episode is no surprise, given that TorrentFreak says "Game of Thrones" was the most pirated show of 2012. According to its estimate, 4.3 million people downloaded the season finale last year, nearly a half-million more than downloaded the second-most pirated show, the Showtime drama "Dexter." TorrentFreak did not have an estimate for the total number of people who have downloaded this year's premiere so far. London is the city with the most illegal downloads of the episode, it said, while the country with the heaviest downloads was the United States, followed by the U.K. and Australia. Those downloading the file were using BitTorrent, a free software system that lets users swap large media files. It is widely used to illegally trade movies and other copyrighted content. Hollywood is concerned about illegal downloads, but HBO programming president Michael Lombardo told Entertainment Weekly recently that the network sees the piracy of "Game of Thrones" as a sign of success more than a problem. "I probably shouldn't be saying this, but it is a compliment of sorts," Lombardo said ahead of the season 3 premier. "The demand is there. And it certainly didn't negatively impact the DVD sales. [Piracy is] something that comes along with having a wildly successful show on a subscription network." It's HBO policy to fight piracy of its shows, particularly when it finds people illegally selling episodes of its shows, but the network isn't going after individual viewers, Lombardo said: "We haven't sent out the Game of Thrones police." HBO, Entertainment Weekly and CNNMoney are all units of Time Warner (TWX). In a recent interview with CNN's Jake Tapper, "Game of Thrones" co-creator David Benioff speculated about all the special effects he could buy if those who illegally pirated the show were paying 99 cents or so per download. "You do kind of think, God, if we just had a little bit of that, we could have had that extra scene with the dragons," he said. Fans who might be willing to cough up that 99 cents for a pay-per-episode purchase of the new season don't have any opportunity to do so. New "Game of Thrones" episodes are available only to HBO subscribers, through its cable channel and its HBO Go on-demand app. Viewers outside the U.S. typically have to wait a week or more for new episodes to reach their local markets.